The Following God Bible Study Series from AMG Publishers is made up of five different categories of Bible study products ideal for group and individual study. All five categories typically follow the same basic format with five daily readings per lesson and loads of interactive application sections, sidebars, charts, illustrations, and background information. Books targeting adults are in workbook format. 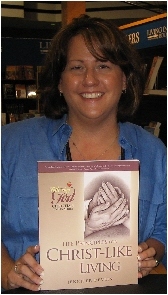 Jennifer Devlin, author of Life Principles for Christ-like Living is currently scheduling speaking engagements for congregations and groups that are going to utilize this twelve week study within their curriculum. Contact Jennifer today to set a date for her to encourage your group in the word of the Lord! "You have a real smooth-flowing way of saying what needs to be said. You have a gift and God has an investment, one that will only get better with use. Be faithful, Sister. You are just getting started." What do Abraham and Moses have to do with living a Christ-like life? What does the church at Laodicea teach us about godly living? Why do we need to know about the ministry of Jesus if we are to live like Him? All of these questions, and many more, are answered in our twelve week journey together. In Life Principles for Christ-like Living, Jennifer Devlin offers readers a deeper understanding of key concepts in Scripture and how they relate to living a Christ-like life. Each week the participants will discover how to live godly lives through the truths shown in various "3:16" verses of the New Testament. Readers will experience the connection of living a Christ-like life revealed through Genesis to Revelation, and will learn how to apply these truths to their lives. These key verses will help us discover that the actions, encouragements and corrections from Jesus and His disciples have a great impact on how we can live a life that reflects Christ in all we do. Did you find a typo? Please help us prepare for the second printing of this vital study. If you find a mistake, typo, or need for correction in formating, please email Jennifer with the information. On page 44, please look at the fourth question located in the middle of the page. Where it says "Matthew 26:51", please change it to "Matthew 27:51". The typo makes for a comical mistake! Thanks for your patience, and for making the correction to your book. On page 51, the first "read" section, the last sentence says "This statement of fact...Gabriel in the Holy of Holies..." this should read "the Holy Place" - the Altar of Incense is placed just outside the veil; just outside the Holies of Holies in the Holy Place of the Temple. I apologize for this typo, and thank you for checking the website for the corrections.